A lot of us think of our design before we come up with the place that we’d like to put it on our bods – especially if we’re running out of clear territory! If you’re thinking about inking up your shoulder, or just want to check out some cool designs that you can place there, we’ve got you covered. Getting a tattoo is a big commitment, it’s like signing on the dotted line of a lifelong contract. Tattoos are with you for life (well besides laser, but let’s not think about that right now) so it’s important that when picking the right design that you get something that works with that area of the body. What do we mean by that? Well lets take the shoulder for example. A very popular area to get tattooed by both men and women. There are many reasons it’s a popular spot to get inked, but for the most part it’s due to the fact that you can choose to show it off with a tank top at the beach or you can cover it up in the office with a business shirt or even a t-shirt, depending on the design. 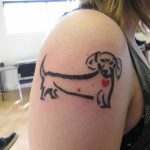 When choosing the appropriate tattoo design for the shoulder area, the first thing we should consider is that the shoulder is rounded. With this in mind, choose a design that works to the curves of your shoulder shape. Secondly, the shoulder is also a (comparatively) large surface area, so this generally means that smaller size tattoos will work better here, especially because you can extend them around on to the back, the front or even down the arm in to more of a sleeve design.Here are our 20 Small Shoulder Tattoos Designs And Ideas.Enjoy and get inspired! !